The perfect place for your holiday in the Peak District. 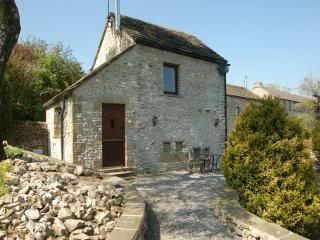 The Old Piggery is a dog friendly cottage located at the edge of Tideswell up a secluded lane. It boasts beautiful views across the Peak District countryside. The cottage is ideally situated for walkers and all those who enjoy the outdoors, yet is only a five minute walk to the village centre. Here you will find a thriving range of facilities – including shops, churches, a cash machine and Post Office, three dog friendly pubs, three excellent cafés (two of which allow dogs), and two traditional Fish and Chip shops. For more information about Tideswell, and why it is a great base for your holiday, see here. The Old Piggery is a small but perfectly formed ‘upside down’ cottage – ideal for a romantic break for two. For more information about what the cottage has to offer, please see here. But don’t just take our word for it! You can find out what previous guests have said about The Old Piggery here. Tilly and Dillon from Your Dog Magazine stayed at our larger cottage, Welyarde, in September 2011 and produced this review. And Lottie and Murphy from Dogpeople stayed at The Old Piggery in May 2014 – click here to see what they thought! Some cottage owners tolerate dogs (provided they don’t go upstairs, sit on the furniture, bark, drop a single hair etc etc.). We’re different. At The Old Piggery we truly welcome dogs. They deserve a holiday as much as you do! To find out why your dog(s) will enjoy their stay at our dog friendly cottage see here. As well as The Old Piggery, we also offer a larger 3-bedroom dog friendly cottage called Welyarde – which has a large enclosed garden. Further information from the Welyarde website.